Will you be my short-wave station? Will you be my Dairy Queen? Will you be my destination When I burn out? Will you be my short-wave station? Will you be my cruise control? Will you be my destination Now I show signs of growing old? Will you be my restoration? Will you be my decline and fall? Will you be my own road movie? My mother always told me that life is like your own little movie. You play the main role and bring in your own cast of supporting characters. You help direct the plot and there will be a mixture of drama, action, and comedy. Hopefully you will have little or no horror, and hopefully you will be blessed with some romance along the way. If life truly is like a movie, then that means that you can be your own location scout and it also means you get to pick the soundtrack. Being a resident of the great state of Texas, the lyrics above are very familiar to me. There have been many times when I have gotten into my old beat-up Honda Accord (which chugged past 200,000 miles a while ago) and just set out on the open road. It is a great feeling to lock the speed in at 70 and ride for hours without a particular destination in mind. Dairy Queen advertises itself as a "Texas Stop Sign" on billboards across the Lone Star State. All you need at this point is to find a good radio station, and if you do luck into one, let's hope it is playing the band behind this song -- the British quartet Minibar. These lines are from the title track to the band's first album Road Movies. The band received some acclaim for its first major release, allowing Minibar to have the honor of opening for, oh, a little group fronted by Jakob Dylan called the Wallflowers. Minibar draws its name from the title of a song penned by lead singer Simon Petty prior to the band's formation. When these four musicians realized that the sound they loved was not going to fly in the U.K., Minibar packed up and followed their dreams westward to the California coast. Backing up Petty are guitarist Tim Walker, bassist Sid Jordan, and drummer Malcolm Cross. Not too long ago, Minibar parted ways with its record company and signed on to the recent brainchild of Pete Yorn and Wallflowers' keyboardist Rami Jaffee called Trampoline Records. The quartet has been getting most of the attention and investment of the young label and plans to release a full follow-up album to Road Movies by the end of 2002. In the meantime, Trampoline has released a compilation of five new Minibar tracks on The Unstoppable E.P. This disc clocks in at just over twenty minutes, which is shorter than my commute between home and work. While this CD was becoming one of my new favorites, I learned that Minibar was in town on a tour stop. I caught the band on September 13, 2002 at Casbeer's, a historic little restaurant and live music venue in San Antonio. The duo Gingersol opened for Minibar, but I wouldn't go about calling it "opening," because three of the 'Bar-members joined in to play on Gingersol's selections. If you needed any proof to how closely knit these two bands are, all you needed to do was to look at the hat that Cross was wearing behind his drum set-on one side it read Gingerbar and on the reverse was printed Minisol. Hearing Minibar play live gave me an even better appreciation for their style and allowed me to get to know the musicians as people. The set list consisted of about a half dozen selections from Road Movies, four of the five songs off the e.p., and a few other unreleased tracks and covers. Minibar's current single "Unstoppable" is a story about the realization of love. To quote another Petty, "Good love is hard to find," and we truly are lucky when we fall into it. Sometimes emotions such as love are difficult to express. Trying to put those words together into an expression that truly captures how one feels can seem impossible. "Unstoppable" begins at its outset as a laid-back tune in triple meter, but as our character experiences the rush pouring through his veins, the dynamics pick up and the guitar lines soar. The lyrics are sensitively treated and this song sounded outstanding live. The charismatic Simon Petty delivered a heartfelt performance with his breathy singing style and proved at the outset why he is the foundation and spirit of Minibar. We learn later on in the song that he is alone because of a falling out he had with someone whom he obviously really cared about, given his now dejected and almost-numb state. Fortunately, things can be "simple once again," for no matter how bad things seem to get, Minibar reminds us that life is all about cycles. Sometimes, we just need to be shown the light literally and we will see things in a new perspective. Petty has a haunting and unmistakable voice, and it is a perfect fit for this song. By the time that the storm in the song breaks, the clouds clear, sunlight emerges, and the other members of Minibar provide some great harmony in a highly triumphant and reassuring finale. While lead man Petty wrote or co-wrote four of the songs on this disc, Jordan penned the track "Breathe Easy." If you happened to turn this song on in the middle of the chorus, you could understandably mistake Minibar here for the Wallflowers. The connection is supported further, given that Rami Jaffee produced three of the five songs on the disc and provides his signature talents on the keyboards as well. "Breathe Easy" is a beautiful ballad that will really tug at your heart. The musical treatment is so sensitive that you will even see Cross break out yarn mallets for the suspended cymbals and brushes for the snare in the performance of this song. The song from the e.p. that drew the best reaction from the crowd was a track called "Fly Below the Radar," which I would advise Minibar consider releasing as a future single. "Fly" seems like the most radio-friendly effort on the disc and deserves to have an audience. It explores the theme of falling so hard for someone that it hurts. This is Minibar's most interesting work on the disc because the band's influences and variety of musical styles combine into a tasty brew. You can hear the British pop that the band members grew up around. There's a bar sound that oscillates between the music you might hear in a Texas honky-tonk to something more rock-sounding like the Gin Blossoms (think "Until I Fall Away"). Then, the very next line is "Cause I'm like a broken record / I spit and jump and hiss." The effect could have set the stage for the rest of the song quite well and considering Yorn and Jaffee are the ones behind Minibar's new label, it's interesting who had an influence and who did not. But I don't want to take anything away, because this is a wonderful tune. Within the song, there is a wonderful extended analogy comparing the feeling of falling so hardly in love with someone to the thrills of riding a rollercoaster. Petty's lyrics and Minibar's musical setting and convincing performance make "Fly Below the Radar" a standout track. The final song on the disc is "Badlands," which seems misplaced as the closer to the e.p., considering what it has to follow. It is a rather heavy song about loneliness and contains a good deal of figurative language relating to fire. This song was not part of the concert set, allowing Minibar to showcase some of its great earlier material. From the Road Movies album, Minibar pleased the Alamo City crowd with the songs "Six Foot" and "Lost In the Details." After announcing that the next song would be an old English folk song, Minibar pulled off a twangy cover of The Smith's hit "Ask" quite well, drawing much applause from hands that took a brief pause from feasting on Casbeer's signature enchiladas. 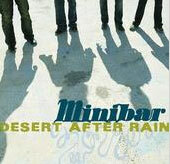 Minibar also treated San Antonio with the band's biggest commercial success, "Choked Up," a song appearing on the soundtrack to the film Jay and Silent Bob Strike Back. For this number, one of the Gingersol members returned to the stage to play keyboards, an addition that is like whipped cream and a cherry on top of a sound that is already remarkably delicious. Success for Minibar is definitely on the horizon. You can count on hearing a lot from this band for many years to come. Their music is appealing and while the band might not sound that special on first listen, Minibar quickly grows on you. They do what they do very well and fuse a variety of influences into a rich combination. As musicians, these four men are very impressive, and are equally extraordinary as people. They are modest, good-humored, sensitive, and gregarious. The image that I am going to remember from my Minibar concert experience is that of Simon Petty sitting at the table next to me while Gingersol was playing, and he had a digital camcorder out with a smile across his face. He obviously loves what he is doing and it was neat getting to see him and the guys enjoying the moment. I guess you could say they were literally making the next scene in their Road Movie. So, what are you waiting for? Break that ol' plastic tie around the handles of the Minibar and see for yourself what sweets lie inside for you. Pick up your copy of The Unstoppable E.P. today from www.milesofmusic.com and see if the five-song appetizer whets your appetite for the new Minibar disc due out later in the year. If the e.p. does not tide you over, check out Road Movies or learn more about the band on the Web, at either www.minibar.uk.comor www.minibarfans.com.